"I have a great time working with other songwriters. It's an inspiring process." DeGraw's Make A Move includes the song Everything Will Change - the newly picked US Olympic team anthem. 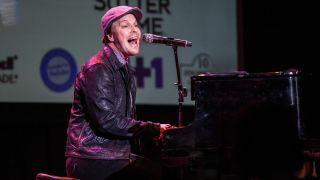 "I'm lucky to make a living as an artist," says singer-songwriter Gavin DeGraw. "I base everything on what it was like when I had a real job. Doing what I do isn't a real job; it's a fun job. There's people out there who work a lot harder than I do, and they're doing something they don't like. I've had bumps in the road, but as long as I don't have to go back to carrying people's food to their tables and hauling their luggage, I can take whatever comes my way." With four hit albums under his belt, and his newest, the recently released Make A Move, looking like a keeper, it's doubtful that DeGraw will be tagging your bags or serving you a pina colada anytime soon. As he did on 2011's Sweeter, DeGraw surrounds himself with a heavily pedigreed array of songwriting and producing playmates (Butch Walker, Ryan Tedder, Martin Johnson and busbee, to name a few), and while the results could have easily been a too-many-cooks fiasco, Make A Move is a remarkably personal, smooth and consistent listen, both big-hearted and broad-minded. DeGraw made his name mixing up blue-eyed soul with classic rock, and here he spreads those waters further while even dipping a toe in the Europop pond. DeGraw sat down with MusicRadar recently to talk about Make A Move, the joys of collaboration, his biggest influences and what one song by somebody else he can't stop playing. I read an interview with you recently in which you talked about how much Billy Joel influenced you. It's funny - artists don't mention him a lot. "Yeah, that's weird, isn't it? Maybe it's because he's regional in some ways. I mean, he's big all over, but he does have that association with New York. I think he has a lot of class, and that could be part of it, too: Some artists think that it's cool if you look filthy on stage, and you don't wash your hair and stuff. I guess Billy Joel never looked punk rock for certain people. To me, his music goes way beyond hair and clothes. He's made some of the best music in years. You can't take that away from him." Besides Billy, what other artists influenced you? "It's pretty diverse. I grew up listening to so much music and got into all kinds of things; there's a load of stuff from the '60s and '70s. My parents were from New York state, from the Catskills; I grew up about 20 minutes from Yasgur's Farm, so there was still a lot of that culture from the hippie era. I knew a lot of the rock and folk and psychedelic music that came from those parts. "I also grew up with a lot of classic country music. Whenever I'd be at my dad's father's house, that's what was being played. My earliest musical memory is probably hearing Hank Williams' Hey Good Lookin'. My dad's father was a real cowboy-oriented music lover. I mean, he was buried to the song El Paso by Marty Robbins. "From my mother's parents' house, there was gospel music, opera, musical theatre - a real mix. So I grew up with all of those styles and influences. On my own, I got into Billy Joel and Elton John, Queen, some of the more piano-based rock - you know, dramatic stuff." "Yeah, that's right, I did." Was there any kind of writer's block? Because you certainly made up for lost time - your next three records were only two years apart each. "It's funny because there was no writer's block. The time between the first and second album was due to a couple of things: One, because it took so long for the first album to catch on. I released that album in July of '03, and I don't feel that I experienced any kind of success from it until deep into '05. By that time, the album had been out for two years, and that was the first opportunity I really had to generate some income off of it by touring. For the next year and a half, I was able to get on my feet and play shows. "Then I had another album that was finished about a year and a half before you heard the self-titled album. At the time, I brought it in and was told that it wasn't up the alley of what they were looking for; they wanted me to rerecord it with a different guy and stuff. The record was done, though; it was in the can. And I was really happy with it, too - a good-sounding record. "So that experience set me back another year and a half, which was obviously damaging to my career, in my opinion. By the time I put the second record out, I had lost pretty much all my momentum. It was sort of like starting all over again." You certainly aren't the first artist that Clive Davis sent back to the drawing board. How hard was that to deal with? You have an album - you like it, you think it's great - but you're told, "Nope. Not yet." "You know, that's just the nature of the business. There's more people to satisfy than just yourself. I did feel that I had made an album that was ready, that was up the alley of what was right to make for a second album, but he thought that he wasn't getting what he was looking for. Maybe it wasn't perfect, but that's just the nature of the beast." As you did on Sweeter, you worked with a variety of producers and writers on this album. Your first few albums were very much solo efforts. Why the change? "You know, different things come out of me this way. After writing my first few albums alone, and feeling like I had to do them alone - see, I had this position as an artist and a writer that if I was gonna tell people I'm a solo artist, therefore I should be the only person writing. It seemed to be the most sincere way to put that out there. "So I was writing and writing and writing to make Sweeter, and I had a bunch of songs - I continued to write because I pretty much write something every day. After a while, I was looking at my subject matter - the angles, the modes I was writing in, the tempos - and I thought, 'I need to break this up.' I thought that I needed some other kind of influence. "I called Ryan Tedder, because we had talked about doing something, and he's somebody I really respect as a writer and producer. We made some time and got together, and I felt like we had a real connection and just clicked. Then I contacted a guy named Andrew Frampton, who does a lot of work with The Script. Those were my first attempts at co-writing, and I had a lot of success there, particularly with the single Not Over You. "This was all the start of a new type of career, where I felt like I was more a part of a music community, with people who write and co-write and do more of the process that I wasn't involved in. I feel like co-writing made me a part of that community in a really positive way. Doing things on my own, I was the Lone Ranger with no Tonto." What it like working with Martin Johnson from Boys Like Girls? The two songs you did together, Best I Ever Had and Everything Will Change, couldn't be more dissimilar. "Oh, man, he's a great guy; we clicked right away. Yeah, the songs are totally different, and we took very different approaches in the writing. Martin is lyrically very savvy. Everything Will Change was the first song we wrote together, and it felt really great right away. It was very personal and inspiring lyrically; we said, 'Let's write it like it's the next Olympic theme. Let's make it feel that important.' And we were really fortunate to have the USOC pick it to be the new US Olympic team anthem. So we set out on a path and saw it through." "Oh, yeah, Butch is great. Some of my favorite cuts on the last record are the ones we did together. He's a real musician's musician, a very savvy writer and producer. He's like a real soul brother and musical brother of mine. We feel music the same way. He's so far up my alley, the way he hears sounds." "I've never really had that. I've been pretty lucky in that once I've made a decision to write with somebody, we never hit a wall. Like I said, I have a great time working with other songwriters. It's an inspiring process. Some people have a difficult time with it, but I think it's great to be in a room with someone who has a real opinion and is willing to be honest, to say something is either good or not good, you know? "Some people offer more than others, but that can just be down to whatever day it is - the ideas might not be flowing as freely. You might go in the next day and they're just crushin' it for you. The beauty of it can be in the consistency - you find those moments of magic to document as a writer: 'Oh, wow, that's great. Let's keep going.' Ultimately, you get through it and go over that wall, or around it or whatever." What was the last time you heard a song by somebody else that was so good, it made you jealous that you didn't write it? "Oh, man, I hear them all the time! [Laughs] There's so many good songs out there. One of my favorites that I keep listening to is by The Black Keys, their song Next Girl. It's so cool, that one."